Surgery can be a scary thing. Our cranio kids go through multiple surgeries at all stages of their lives and each procedure comes with a certain amount of anxiety and apprehension. Being prepared can reduce some of the stress and make your hospital visit more comfortable. Today, Liz offers her top tips for being prepared for surgery. Check back tomorrow for our wrap up of the #surgeryproblems series. Preparing to go to the hospital can be stressful enough, but when it’s for your child undergoing testing or surgery, that all gets magnified a hundred times over. In our house we make lists to get ready. Lists of bags and lists for what goes in each bag. Lists of clothes, lists of medications, of electronics, snacks, and books. We have refined list making and bag packing to an art. When I was asked if I would write about the top five things to bring with you to the hospital, I knew just what to do. I consulted the stack of dog-eared legal pads containing list after list from years of vacations, grocery trips, and (of course) hospital stays. 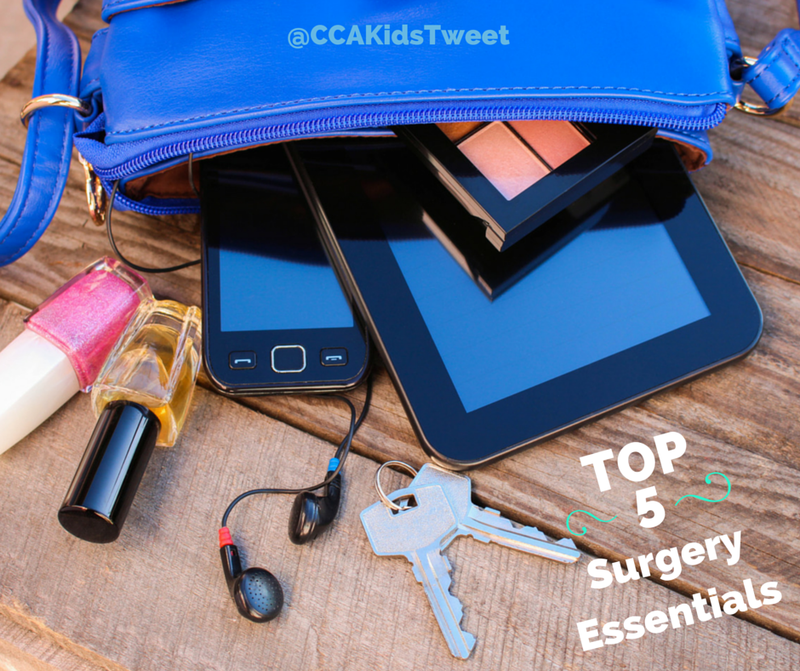 #5 Chargers and headphones Keeping chargers and a set of ear buds on hand can make the stay a bit more tolerable for everyone. Headphones not only keep your distractions to yourself, but they can do wonders for blocking out some of the drone of the hospital. My favorite use for headphones? They can act as a wearable “Do Not Disturb” sign for when you need a few minutes uninterrupted. Making sure to bring chargers for your electronics can mean the difference between feeling stranded at sea or being well connected to your support network. #4 Personal Care Bag Clean socks, deodorant and other assorted “foundations” are just a few of the necessities we stash in what has affectionately become referred to as the “Mom Bag.” Even if you can’t squeeze in a full shower, being able to splash some water on your face and freshen up a bit can do wonders for how you feel. Think of it as a “soft reset” on your day. The other must have items in the Mom Bag are a quality assortment snacks. Granola bars, dried fruit, and individual packages of almonds are favorites. The protein does wonders to keep you feeling full between meals and stave off the hangries. #3 Medications It never ceases to amaze me how many questions there are surrounding medications that are clearly in your child’s chart. Bringing them with you allows staff to clearly confirm any medication, prescribers, doses or pharmacy information, and gap any coverage on long rides home. Make sure to stock it up with things for you, too! Having ibuprofen and antacids at the ready are beyond convenient, and it’s one less thing to try to track down if you need it. Double check to make sure you have any daily medication you require as well. If you aren’t taking care of yourself, you won’t be able to take very good care of your child. #2 Favorite stuffed animal or blanket There is a small troupe of comfort items that are a deal breaker if they are left at home during a hospitalization. They consist of a floppy baby doll version of Snow White, a small Taggie square, and a crochet lap blanket. For the last five years, these three items have been able to bring security, familiarity, and comfort to some pretty stressful situations. Baby Snow has been in more MRI’s, x-rays, and operating rooms than I can count, always with our little lady in their matching hospital ID bracelets. That doll has been able to be with Tiny in places that it was just not possible for mom or dad to go, and has been the “patient” in many exams, showing our little one that she had nothing to fear. #1 Notebook or Journal Questions about care don’t always come to the front of your mind when doctors are rounding or the nurse is in the room with you. Keeping a notebook in the room with you will give you a designated place to write these questions down, and the answers you receive. It’s also a great place to jot down notes about which doctors were rounding, any tests and results, medications, and any reactions your child is having. These can be so helpful to reference if/when your child has to return back to the hospital, and you can flip back and have information on things like what works best for pain management, or how long swelling lasted, etc. We don’t always have the luxury of being able to plan and prepare for a hospitalization, but when we do, having a few key items can make a huge difference in the stay. Jason and Liz Cox live in Springfield, MA with their daughter, Nova. They knew relatively little about the craniofacial community until they received Nova’s diagnosis of Pfeiffer Syndrome shortly after her birth in 2009. Jason is a former roustabout, Liz is an avid recycler and Nova is patiently waiting for the spring planting season.